Sorry Jesus. 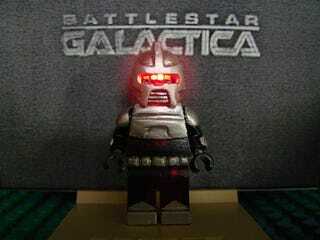 The Star Wars Minifig may be nice, but it's got nothing on this Battlestar Galactica Cylon LEGO minifig. Its eyes light up (just like yours) but has that glowing red dot flash back and forth like in the show. Yes, the light moves. We have it on video. THIS is the best use of light-emitting diodes sir. Good day!